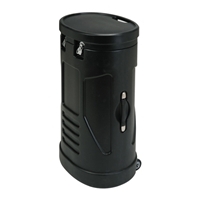 Holds two 50w halogen lights. Protect your lights inside the case Protect your display with this roto-molded shipping case. Includes handle and wheels. Fits Wave Tube Displays 20' and smaller. Converts to an attractive counter with an optional graphic kit.